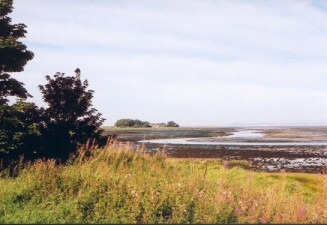 The photograph shows a view over Aberlady Bay towards the old customs house, a view which world reknowned Scottish novelist Nigel Tranter must have seen hundreds of times in his lifetime. The spot where it was taken is only yards from where he daily crossed the wooden bridge to the nature reserve where he wrote as he walked, the area giving him endless inspiration. But this is a long way from where he made his first entrance into the world in 1909. On 23rd November of that year he was born in Glasgow, and then went on to be schooled in Edinburgh. Castles and Their History As a youngster he had a great interest in castles and their history and many years later, in 1935, his first published book was on this subject. But it would be a further two years before he had his first 'proper' book 'Trespass' published ( his wife May did not consider books on castles and the like to be 'proper' books ). But let's return to his younger days. When he left school he was taken on as an apprentice by an architectural firm in Edinburgh but was unable to carry on after his father died as the fees were prohibitive. Instead he took accountancy training and worked for an insurance company owned by his uncle. He was there for ten years, only leaving in 1939 to join the war effort. He served in the Royal Artillery throughout the hostilities. Writing and World War 2 Although there was a war to be won this did not stop his writing, and between 1941 and 1945 he had work published most years. I don't know when he first came to live in Aberlady, but he stayed for a time in Cross Cottage in the centre of the village, before moving to Quarry House, situated close to the Nature Reserve, where he stayed for many years. Even though he was then living outside the village boundary villagers still considered him 'our writer in residence'. Nigel was such a prolific writer that by the time he died in 2000 - he was living in Gullane by then - he had written almost 150 books, but what many people don't know, particularly those who only know him for his scottish historical novels, is that he wrote books in other genres, including westerns under a pseudonym. One of his books which had relevance to Aberlady was 'Bridge of Enchantment', the cover of which had a picture of himself on the wooden bridge ( as it is known locally ) which he had crossed so often. The books he will be remembered most for though are his Scottish historical novels which will ensure that Scottish writing will remain in the spotlight for many years to come. Note. : The above 'biography' is by no means complete and is only intended as a brief resume of Nigel Tranter's life and career. The Nigel Tranter Centre - formerly in Lennoxlove House, South of Haddington - is now situated in Athelstaneford Church ( the village of Athelstaneford lies Southeast of Aberlady ) The exhibition features many items associated with the writer.